I’ve not seen a “modern” interpretation of Chekhov before. I would argue that this was actually a timeless interpretation of Chekhov. It is hard to place this version in a specific decade because the themes that Chekhov wrote about 120 years ago are still relevant today, and will still be relevant in another 120 years. The costumes are also generic; simple casual clothing for the country workers, and an elegant red jumpsuit for the beautiful younger wife of the Professor, whose arrival torments all the men’s hearts. As the generations before us have passed the buck, our latently idle species (however hard we try to convince ourselves otherwise) will continue to pass that buck to future generations to sort out. Chekhov was rather prophetic in his play writing, questioning the ways things were done and trying to focus on the possibilities of the future; the decline of the aristocracy, the anger and frustration of the destruction of the natural world, and the general mismanagement of the lands surrounding him. In Andrew Upton’s version of Uncle Vanya, the action takes place within the oppressive crumbling walls of Serebrayakov’s estate. Damp, stained wallpaper peels from the walls, dead leaves litter the ground, and in the background a self-playing piano can be heard lamenting the destruction of both land and people as they are consumed by boredom and look to the bottom of a vodka bottle to solve their woes. Uncle Vanya is a play that we can all relate to, a play of wasted opportunities, unrequited love and economic injustices. At the heart of the tale is love. Sonya is secretly in love with the local doctor, Astrov. Vanya is obsessed with Yelena, the younger wife of the Professor, (who was previously married to Vanya’s dead sister). Astrov is also obsessed with Yelena, and blind to the feelings of Sonya; and whilst Yelena is aware of Sonya’s feelings, she too is attracted to Astrov but cannot betray her husband. It is a tangled web they weave, fuelled by love, boredom and vodka. Katie West excels as the sweet, kind natured Sonya. Of all of the characters, she is the one you want to find happiness, the one who could have a bright future ahead of her, but as she delivers the final heart-rending lines of the play, you know her destiny is to continue being taken for granted until the day she dies. Nick Holder (Peaky Blinders, The Game) is equally as impressive as Uncle Vanya with an extraordinary depth of range for the character. At first he seems rather comical, a fool not to be taken seriously, but as his journey progresses you see the whimsy is a façade. His unwanted advances on the beautiful Yelena feel a little creepy, but later on there is a great feeling of sorrow towards him as he explodes with anger, releasing the hurt which has been tearing at his soul as he realises that he has wasted much of his life on people who don’t care about him. Jason Merrells (Waterloo Road) is charming as the visionary Astrov, although for all of his dreams about an ideal future, he can’t see what is staring him in the face! 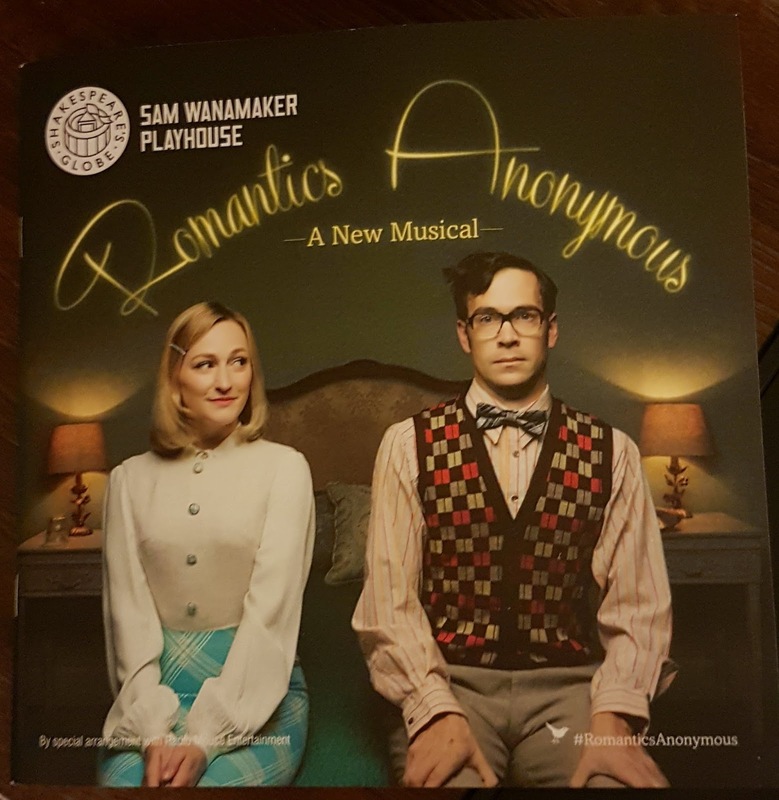 The supporting cast of Hara Yannas (The Musketeers, Broadchurch) as the pretty, bored, younger wife Yelena and David Fleeshman (Emmerdale) as the Professor Serebrayakov add another level of tension to the play as they arrive like a whirlwind bringing a trail of emotional and economic devastation with them. 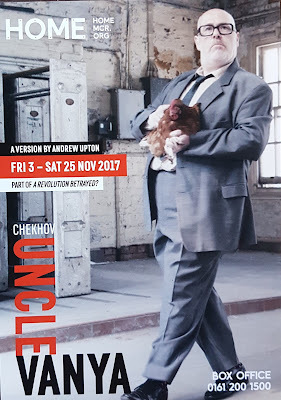 Chekhov paints a clear picture of the destructive nature of depression, but Upton has captured the comedy that peppers Chekhov’s script with some highly entertaining moments and the strong cast has taken this on board. What’s the first thing that comes to a man’s mind when he has drunk too much vodka? Pulling his pants down and dancing around the stage with his trousers around his ankles of course! The moments leading up to the scene have the audience holding their breath, desperately stifling laughs as they watch Astov creep silently up on a sleeping Vanya. You can guess the rude awakening that is ahead of Vanya, and as music suddenly blares out of a stereo and he opens his eyes to Astrov’s bare bum the audience is left roaring with laughter. Schoolboy pranks aside, this is certainly a different type of Vanya. It is a rollercoaster of emotions which show that even if life is not as you intended, life will and does go on, one way or another! 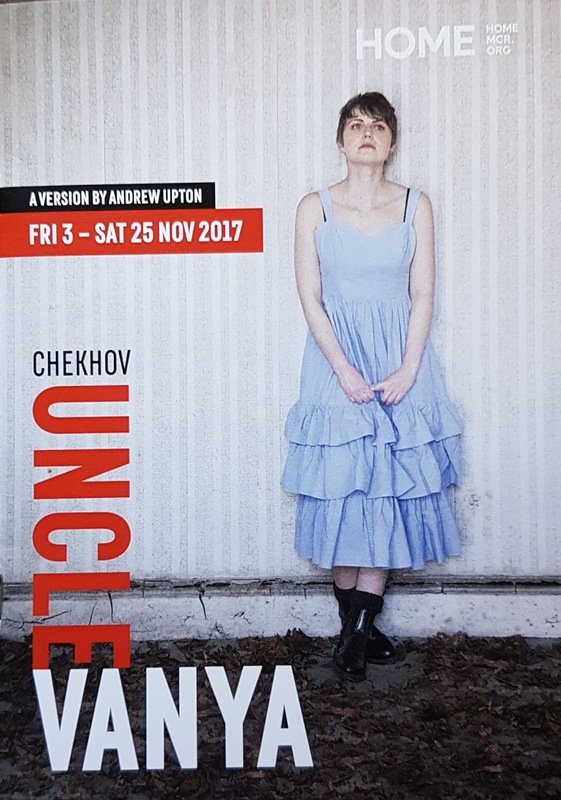 Uncle Vanya is currently playing at Home, Manchester until 25 November 2017. At 11am on the 11th November, we will remember them. Britain declared war on Germany on 4th August 1914. Germany had ignored Britain’s request to stop violating Belgium’s neutrality in its attack against France. The bloodiest battle in history was about to commence. The casualties of WWI far surpassed those of WWII. It wiped out generations of young men, men who had everything to live for, many of whom had such bright futures ahead of them. No-one could prepare themselves for what was about to become. No-one could envisage the horrors of “modern” warfare. Britain was living in the glorious Georgian age of poetry, a soft and meditative state of romanticism. Their perception of war was still one of cavalry charges and heroics for the greater good. How innocent they all were. The brutality of trench warfare was an unknown quantity, but the poets who were prepared to speak out about their experiences would soon change all of that. Even the likes of Edward Thomas who waxed lyrically about the beauty of the English countryside and the world around him would start to write poetry of a darker, bleaker nature, once he took to the trenches, no doubt spurred on by the thought of impending death. Siegfried Sassoon (so named because his mother loved Wagner’s opera’s rather than German ancestry) was blessed to come from a wealthy family. It meant he had a private income so that he could divide his time between that of a country gentleman, and a London literary lover. His world was a far cry from the trenches that he would soon find himself ensconced him. Despite his privileged background, Sassoon was noted for being a courageous, if not almost “mad” fighter. His bravado earnt him the Military Cross, however his acts of bravado led to him being hit by a snipers bullet in 1917. He was moved from the trenches back to England to recover, but it was here that he started to have different thoughts about the war. He made a public statement to his commanding officer "…as an act of wilful defiance of military authority, because I believe that the war is being deliberately prolonged by those who have the power to stop it…” He wanted to be court martialled – instead he was sent to Craiglockhart War Hospital in Edinburgh to recuperate from neurasthenia. The Military Cross he had earnt had been thrown into the River Mersey, not as an act of some symbolic statement against the war, but as something to get him out of his black mood. As a poet, Sassoon employed the use of direct speech so often used by Thomas Hardy in his novels. He held responsible the church, the army and the government for the murder of so many young men who had their whole lives yet ahead of them. Despite his hatred of war, Sassoon felt he needed to see action again, and so he returned back to the front, to the place he had last been posted. But upon his return he was dismayed to find that, despite the enormous amount of bloodshed, nothing had changed. Men were still losing their lives, but for what? Wilfred Owen could be viewed as Sassoon’s young protégé! Brought up in Shropshire, the son of a railwayman, he finished school and took up employment as a lay assistant to a country vicar. Owen became critical of the church, he could see the difficulties that were faced by society and was dissatisfied with how matters were dealt with; he left his post and moved to France to teach English. Whilst Owen may not have believed in the practices of the church, he still believed in Christian teachings and so it was with great difficulty that he made up his mind to finally enlist, a year after the war had started. Within five months of active service, he was diagnosed with “shell-shock” and sent to Craiglockhart War Hospital. This is where he would meet his idol, Siegfried Sassoon. 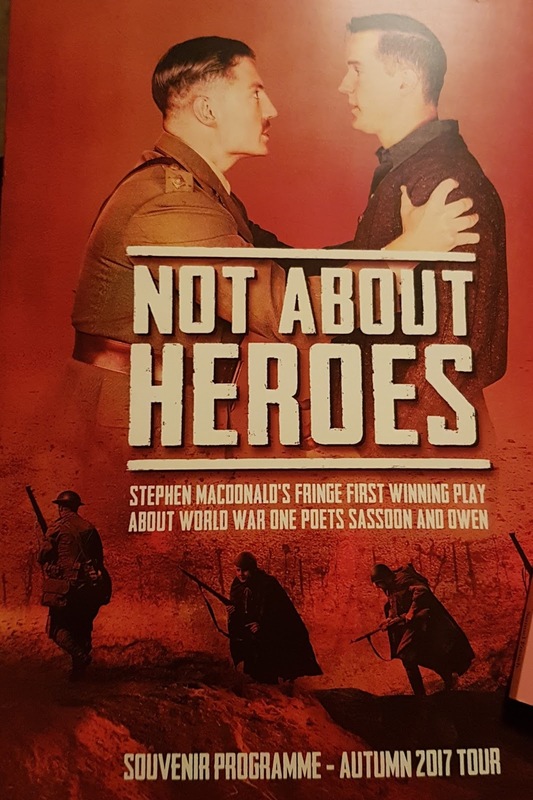 Not About Hereos by Stephen Macdonald tells the tale of their blossoming friendship. Whilst the narrative is fictional, it is based on the letters and memoirs of Owen and Sassoon. Their close friendship led the aspiring poet, Owen, to be taught by the master, Sassoon, to hone his craft and create some of literature's most poignant poetry. Owen’s poetry haunts the soul, but although I’ve read it many times, it is often still just words on paper. Whilst I could empathise with the horrors he had seen, Owen himself was still a two dimensional character to me. 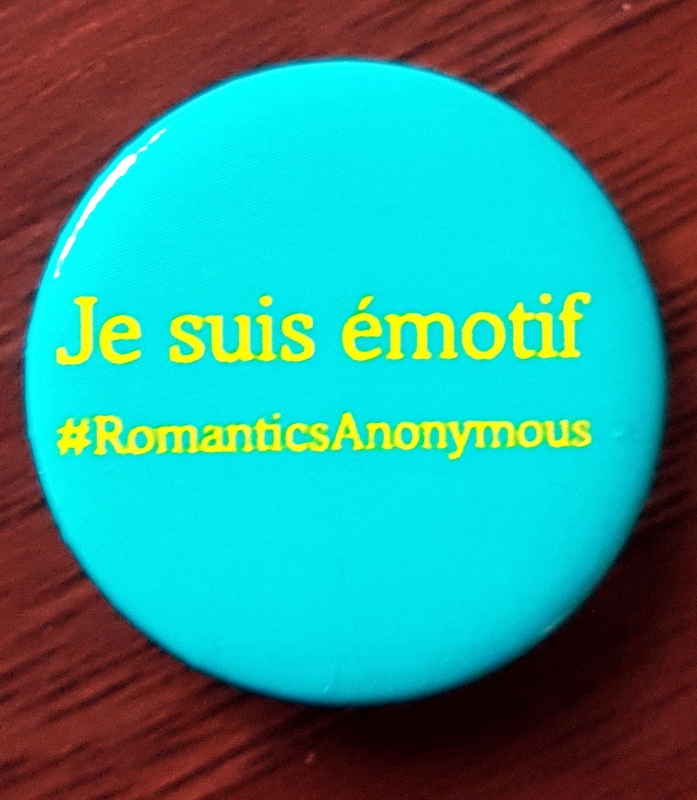 Reading Not About Heroes started to bring both characters to life and their poetry started to become more defined. I could finally start to see the people, the flesh and blood behind those verses. Having read the script beforehand, I thought I would get a little emotional watching; but nothing prepared me for the superbly moving performances in this two-hander play between Daniel Llewellyn-Williams and Iestyn Arwel as they brought these two great men to life before my eyes. With Sassoon’s assistance, Owen became skilled in the use of alliteration, half-rhymes and the creator of pararhymes to reinforce his themes of dissonance. He wrote eloquent verses about the tragedy of young men being killed in battle, the irony being, in order for him to believe he could be a war poet he felt he had to endure the battlefield again, and so he returned to the front only to be killed by German machine gun fire one week before the war ended. He was only 25 years old. He had become the subject of his poems. The voice of a generation gunned down, another statistic of young men who would never be allowed to fulfil their destiny – their hopes cut short by the ravages of war. No-one will ever know what private nightmares soldiers endured either at war or at Criaglockhart, but this play allows us a small window into what was happening a hundred years ago. It is an intimate portrayal of a close friendship that grew because of a shared experience of war and a love of poetry. Flying Bridge Theatre Company has produced a compelling and deeply moving production which recognises the sacrifices made during WWI. It might be about the horrors of war, but it also shows the beauty of poetry and the truth contained therein from the people with experience. 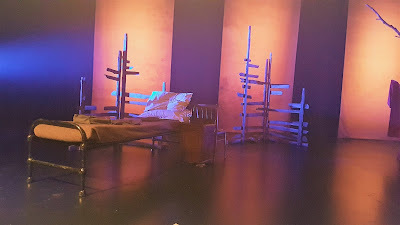 It is a play for engaging the audience into the drama of two people’s viewpoints of a war in which they found themselves immersed; it serves as a reminder that WWI was especially harsh and should not be romanticised like a Georgian poem. It should be remembered that Sassoon himself went from writing about the patriotism and optimism of going into war, to the horror and reality of war, the shock and the anger of the trenches, and an aftermath which we cannot even begin to comprehend. It is a play which will engage you, but it is the spoken words of Owen that will leave the greatest impression. I was blessed to see this play. Unfortunately the tour of the play ends on Saturday 11th November, the date when we remember all that have fought for us, not just those from WWI. I do hope that Flying Bridge Theatre Company will take Not About Heroes back on tour again next year, those who haven't seen have genuinely missed out. He thought he'd better join. He wonders why. Theatre is the gift that just keeps giving. It informs you, it educates you and it entertains you. 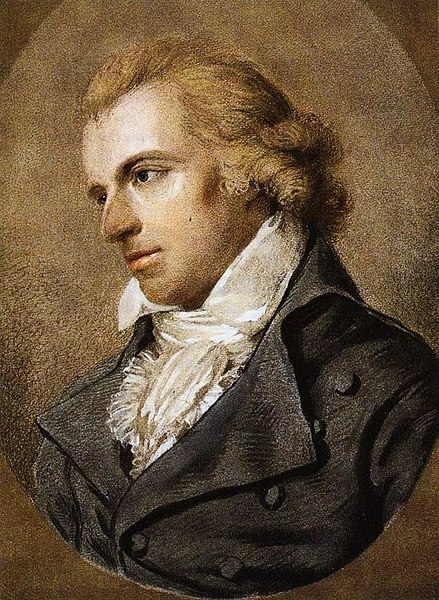 Friedrich Schiller – 10th November 1759 – 9th May 1805, was a famous German playwright, poet and philosopher. He was of great importance and influence in European theatres; however, he has never become mainstream, and still remains relatively unknown in the UK. He had a grammar school education until the age of 13, when he was commanded to go to the Military Academy, an institution founded by Duke Karl Eugen. 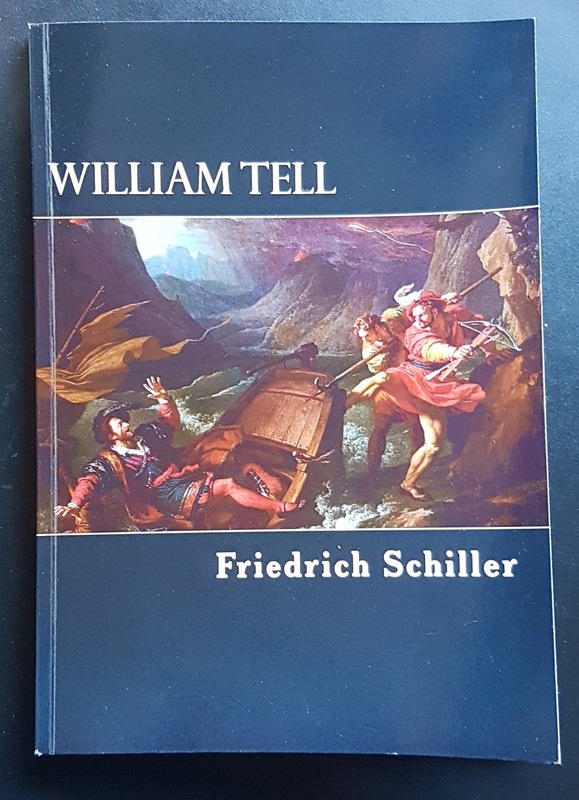 Schiller learnt in his formative years what it was like to grow up under the rule of a petty tyrant who used and abused his power, and this theme echoes through many of Schiller’s plays. Robert David MacDonald (David) 1929 – 2004 was fluent in eight languages (and it is noted could ‘get by’ in 22!) He was a Scottish musician, playwright, actor, director, and he translated five of Schiller’s plays, introducing this influential writer to a new wave of actors and audiences. It was because of David’s idiomatic translations that Schiller became more accessible to the masses. He became the co-artistic director of the Citizens Theatre (or Citz as it is affectionately known) in Glasgow in 1971, a theatre that helped with the careers of some of our best known actors: Celia Imrie, Mark Rylance, Sian Thomas, Alan Rickman, Glenda Jackson, Peter Guinness…the list goes on and on! The Faction are currently hosting a festival celebrating the genius of Schiller between 31st October 2017 – 11th November 2017 at The Bunker Theatre, London. There will be a series of talks, performances and readings by The Faction’s ensemble in collaboration with guest DJs, singers, actors and academics, to showcase through theatre, poetry and opera, the revolutionary spirit of Schiller’s work. I hang my head in shame. 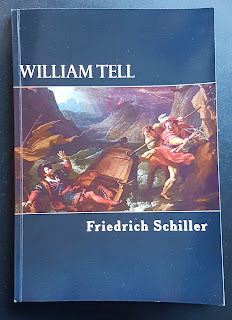 I had never heard of Schiller before, and if it wasn’t for Tom Burke, I still wouldn’t know about either of the extraordinary men that were celebrated during the evening’s events. I saw a tweet five days before the event, confirming that Tom was going to be hosting a Q&A about William Tell at The Bunker, a small theatre that was formerly an underground carpark! Fortunately the stars were aligned; I would already be in London but due to go back home the night of the performance, so it was just a case of sweet talking my boss into another day off work, persuading Virgin to change my train ticket without bankrupting me, and then finding a hotel for the night. I didn’t really need to say much to my boss, as soon as he answered the ‘phone he realised a “Tom emergency” was approaching, and so everything fell into place for a night out in this dark and unique 110 seat studio style theatre. After Mark Leipacher (Artistic Director of The Faction) introduced the evening by saying he expected about 90% of the audience to have never heard of Schiller, my head lifted slightly…I wasn’t sure I’d heard right, but I was happy to accept that statistic! The stage was set. 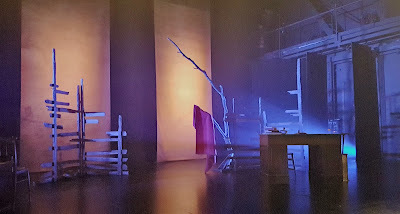 13 chairs were lined up on three sides of the square stage for the actors to sit and read through David’s translation of Schiller’s version of the classic folktale William Tell. In the short time available, I’d bought a copy of William Tell and read it on the train to London. I wanted a vague notion of what to expect on the night. It was a beautifully written tale, with a poetic, almost lyrical quality to it, but I’d not been able to buy David’s version in so short a time. I was looking forward to hearing how his version would sound as it was brought to life by the talented cast of actors, and finding out who would be playing each character. I was transfixed throughout the entire read through, paying attention to each actor as they played their parts with such depth of feeling. Tom only had a few minor roles, which being Tom he put great thought into, using different accents for his different roles, but this was not a night about Tom. Sure, it was his name that enticed me along to see what was going on, but as I sat and watched the story unfold, and felt the intensity of the play rising, there were moments I forgot he was sat just a few feet in front of me. Apparently the play overran. I didn’t notice. 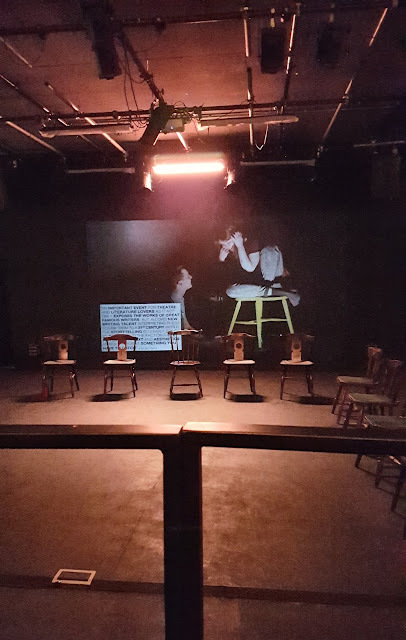 Even though I was only watching an extraordinarily talented group of people sit on chairs, or casually stand up, and read their parts, I was mesmerised. They deserved their applause by the end, they were truly enchanting. There was a short comfort break before a Q&A session, led by Tom, started. I hadn’t kept track of time, but apparently the Q&A was supposed to finish at 10pm. I was told it actually started at 10:10! (One day I may buy myself a watch to check such matters - but it showed that time does fly when you're enjoying yourself!) During the break I sat chatting to one of my friends as a) It was nice to catch up with her as it had been far too long, and b) I’m bone idle and couldn’t be bothered getting up! As I cast my eyes around the theatre, I saw Tom and a few others had come back out and were settling down for the Q&A session. Tom glanced over, smiled, gave a “thumbs up” and mouthed “thank you for coming.” He then gestured that he’d pop over later to say hello. It was a lovely indicator that he'd both recognised and remembered who I was. It had been about 13 months since I last spoke to him and he’s a very busy man, so it was a delight to be remembered with what appeared to be genuine affection. Tom introduced the Q&A. 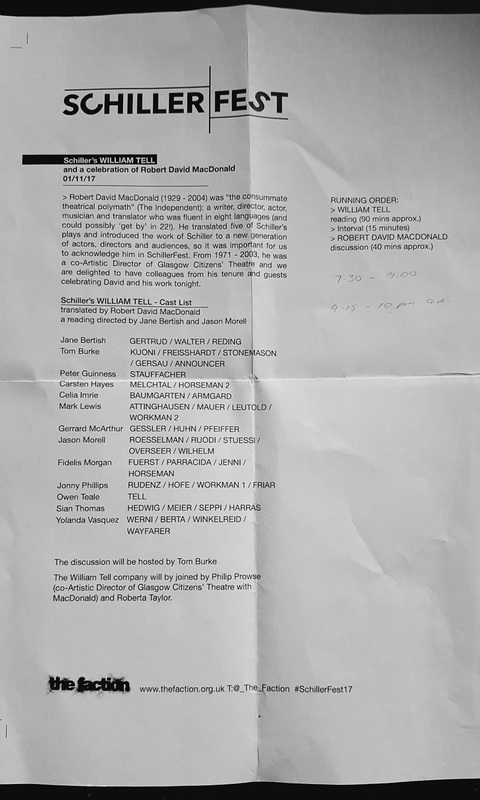 As well as the actors who had performed that evening, Philip Prowse, who had been co-Artistic Director of Glasgow Citizen’s Theatre with MacDonald, and actor Roberta Taylor joined the line-up. 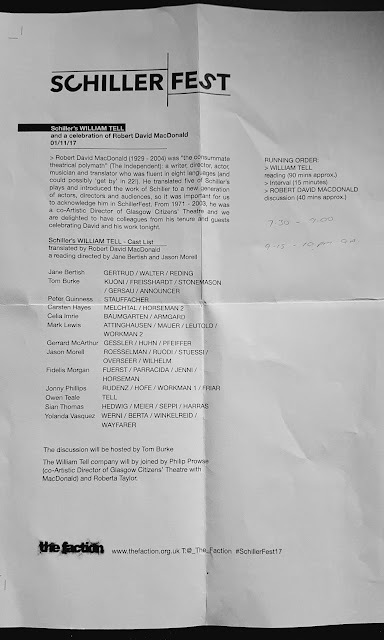 Tom gave a brief background history about MacDonald to the audience, and advised he wouldn’t be saying much because he neither knew, nor had worked with David. He also confirmed that there were a couple of actors, including Owen Teale, in the night’s performance that were also ‘honorary’ members, not having worked with David either! The Q&A quickly dissolved into an evening of reminiscing about the past. It was delight to be a part of. I suddenly felt as though I’d been whisked away to a thespians dinner party, and I was a fly on the wall listening to the gloriously funny anecdotes of the past. As the stories flowed thick and fast, it became an evening to be privileged to have been a part of. David was recognised as an amazing interpreter, who not only could speak various languages, but he understood the cadences of those languages. They weren’t just words, but words with emotional attachments, and that was why his plays worked so well. He was revered at home and abroad, he put Italian plays on in Italy…as Philip Prowse said, imagine, it would be like an Italian bringing Shakespeare to Stratford! It was obvious that those who had the honour of working with him obviously held a great admiration and affection for him. Some of the actresses gushed about what a gorgeous man he was, and how they had been totally in love with him (at this point I did steal a surreptitious glance at Tom to see his reaction!) 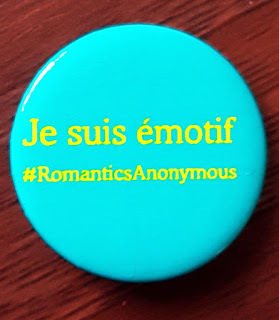 And that was the mood of the evening, not overtly sentimental, but fun, and a sharing of “secrets.” I couldn’t stop laughing as various actors told stories about different plays and Sian Thomas kept piping up “I was in that.” And then a little bit later… "I was in that too. I was very good." Cue for lots of raucous laughter!!! The evening was a fabulous concept, when Tom came over for a chat later I asked him if the whole concept had been his idea. As understated as ever, he confirmed that he was a fan of Schiller and had been approached by The Faction, but that the hard work had really been done by the rest of the actors. Well, whoever was to blame, I told him it was a great idea and a fantastically enjoyable evening. None of the actors fled off straight away; most milled about and then drifted one by one off into the night, allowing those audience members who had stayed a brief opportunity to speak to them. Peter Guinness was particularly chatty, sharing a memory of David which opened up some of the mystery of the theatre. He was doing a play which had a particularly long telephone conversation in it, and Peter was finding it hard to remember his lines. David suggested a large telephone diary by the 'phone with the lines written on it as a prop, so that Peter could flick through the pages if necessary. It worked. Having that comfort blanket meant that he remembered his lines…a good thing too, because David was a bit of a practical joker and had added some choice lines to the book which were not to be read aloud! It was the most magical evening. The Faction and Tom Burke should be proud that they got together to bring the idea alive. The actors involved need to be thanked for putting on a brilliant performance of William Tell…a play that was never performed in David’s lifetime, and for being so open afterwards when sharing their experiences of their time at Glasgow Citizens’ Theatre. 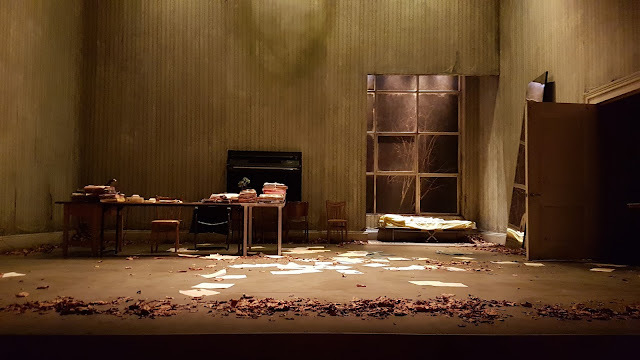 And finally The Bunker needs to be thanked for staging it; a strange but wonderful little venue that I felt very much at home in. If the truth be told, you can give me an intimate gig in a dark and gloomy “carpark” instead of a classically staged west end production any day of the week! Both may hold a place in my heart…but I know where I’d really rather be!